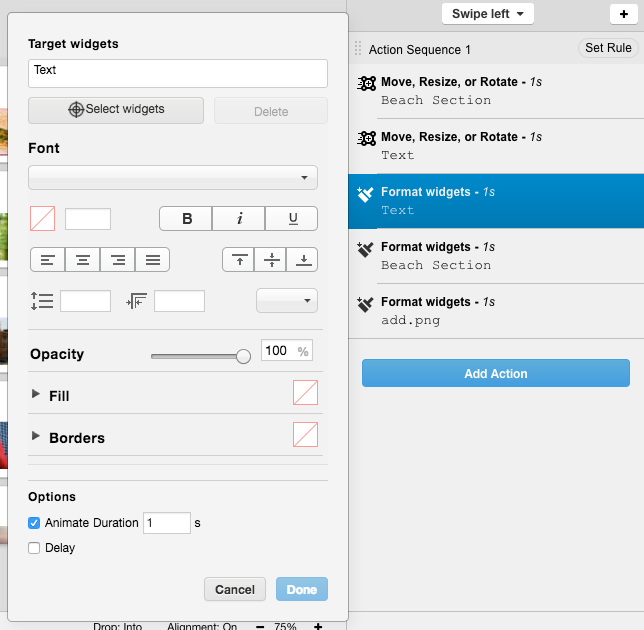 This article describes how to build a page for a swipe configuration in Editor. A popular configuration for a mobile device is to swipe to close a window, as demonstrated below. Keep in mind this is somewhat advanced, and has a fair amount of configurations. But don't worry, if you get stuck we will help you! If you are more of a learn on your own type, you can download the iDoc here. If you would like to follow some steps on how to configure this, please keep reading. To get started, we created a new project with a iPhone page type. We then added a background color to the page. Next off, we created 5 containers, each with rounded corners. 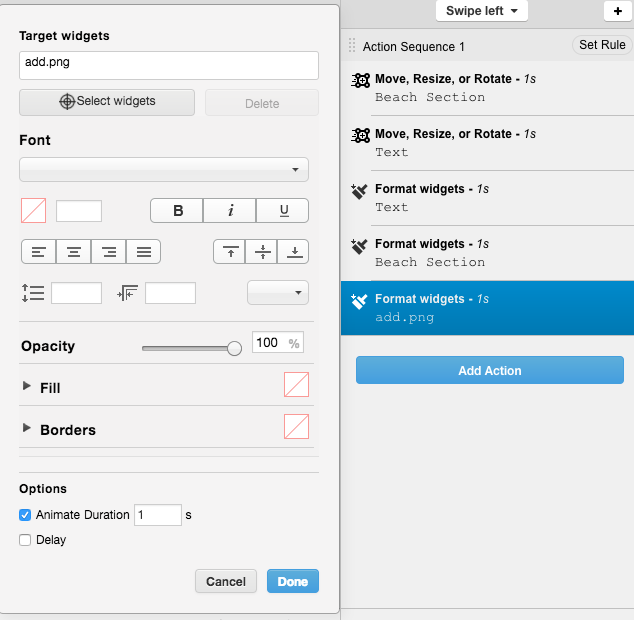 Content was added to these sections, (text widgets, image widgets, etc) and further formatting to enhance the experience. I'd also recommend to name all your containers to make it easier to organize. Now to get into the meat of the project. For each container, you will be adding multiple actions in order for the container to swipe left, disappear, and the remaining containers to move up. Here's an overview of each container, starting from the top down. Notice on the bottom container, it has an added action. This will show the 'Click Here to add a New Photo Album' image you see in the example above. Note that you are moving, rotating, and animating the container. Note that you are adjusting the Opacity, and animating the container. Note that you are targeting all the containers below the top container. You are Moving, Rotating, and Animating them. 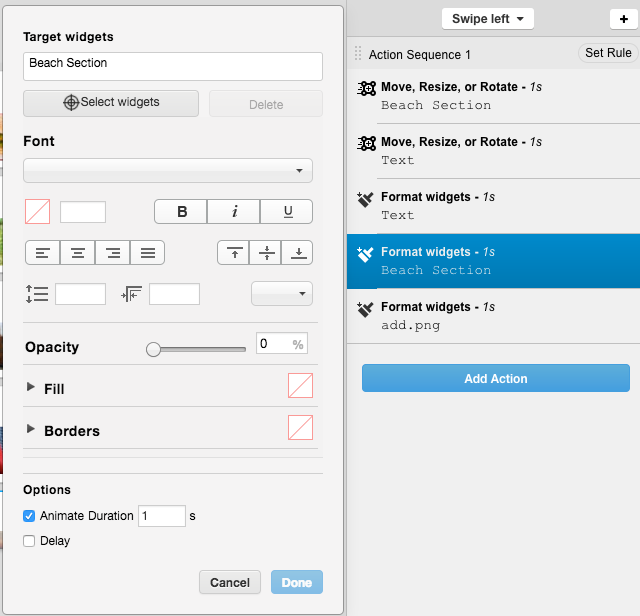 The same type of actions are added on each of the containers, adjusting for targeting widgets depending on where they are in the order. On the the last container, you will be adding actions to show the 'Click Here to add a Photo' text and image. If you run into any issues, feel free to contact us in Support and we will help you out.